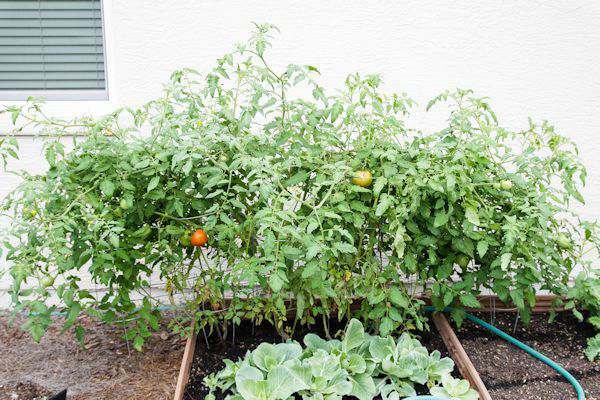 Are your tomato plants too heavy for conventional tomato cages? 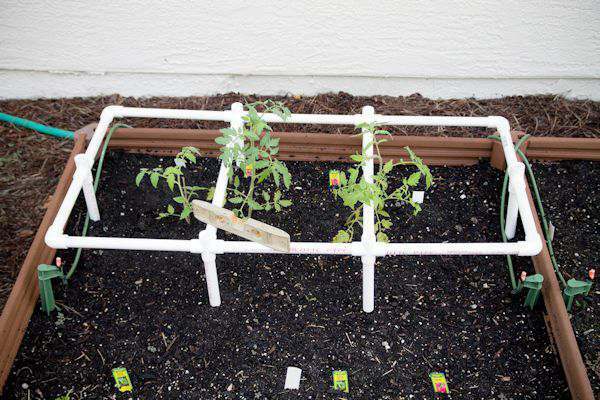 So how you can make a heavy duty tomato cage with PVC pipe. I was finally able to plant my seedlings the other day. I’m a bit behind schedule because of the really cold weather that moved in last week. Sometimes a little bit of a late start will make a difference in a garden in the deep south when it comes to bugs and mold. And I think I’ve finally come up with a solution to my sagging laying on the ground tomato plants. It was time for a really sturdy tomato cage and with the help of my hubby, we came up with the perfect cage for my small garden. 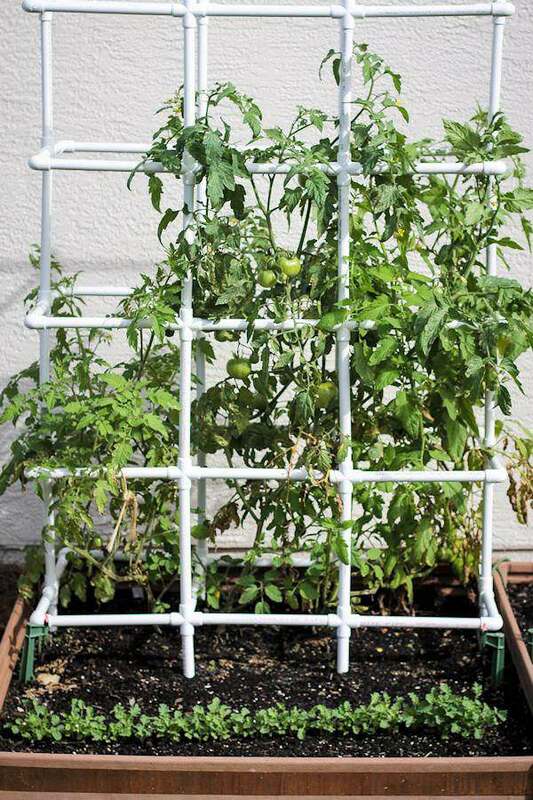 I mentioned last year about how my tomatoes were falling over the sides of the wire tomato cages you can buy anywhere. Any kind of wind and they would fall over. I tried several ways of staking them, but nothing seemed to help. You can see in the picture above how they are overpowering the wire tomato cages. I was using heavy duty galvanized tomato cages which just aren’t strong enough. I do use them for my green pepper plants though. It was time to build a new heavy-duty tomato cage. 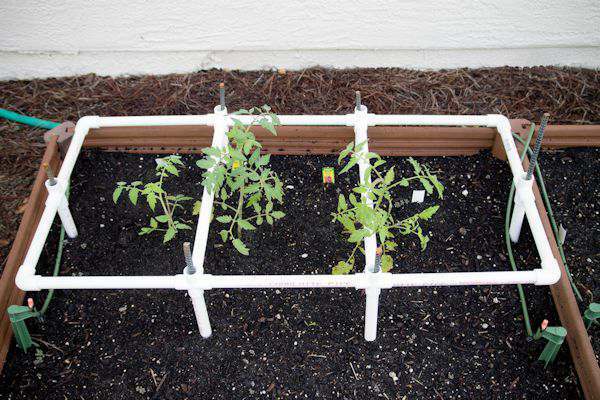 I needed inspiration from my research last year and we decided to go with a PVC tomato cage. It would hold up to the Florida heat, winds, and rain. Depending on the size cage you want to make is how much PVC piping and connectors you purchase. My garden squares are 4 x 4’s, so the cage is about 4′ wide and about 2′ deep. Hubby divided it into 3 sections because I plant 3 plants in a square. He made the first layer and then placed it in the garden to make sure it was level. Next he added the rebar in each pipe that goes in the ground. He decided to use the rebar because the wind can get really strong and wanted to make sure the cage was anchored to the ground. A closer look at the rebar. We found precut rebar at our local hardware store. As the plants grow taller, just kept adding layers. As you can see, it makes a great tomato stand and it didn’t move at all last fall. It’s so easy to reach the tomatoes inside. It really looks nice in my small garden. When it was time to plant for this spring, we just picked up the whole thing and carried it to the next square where I planted my tomato seedlings. To measure where to put the rebar in another area of the garden and not take the whole cage apart, here is what you do. We put the cage in the spot where you want to plant your tomatoes, press down a bit on the cage and then lift it up and set aside. You will then see where to put the rebar where the pipes made a dent in the soil. After pounding the rebar in the ground just place the cage back into position and you are ready for another planting season. For easy storage, just pull apart all the pipes and their connectors, wash and store in your shed or garage. We have our spare parts in a mesh storage produce bags from buying a case of corn. Aren’t they pretty! 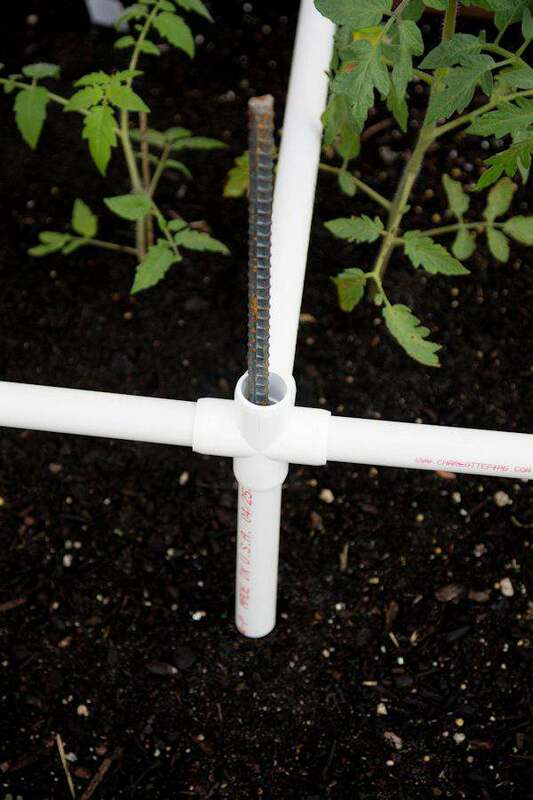 The PVC tomato cage works perfectly to keep the fruit up off the ground and easy to see when its time to harvest. Or as in my case, before the freezing cold came. 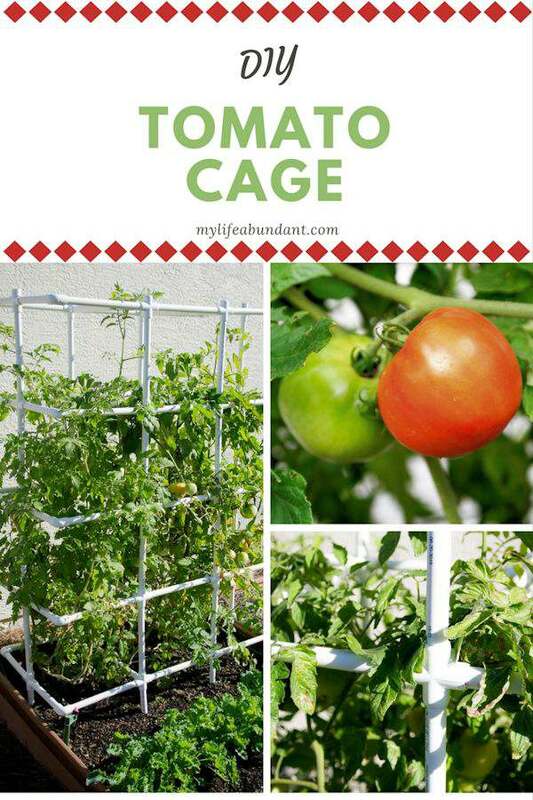 Tomate cage is a good way to plant tomatoes and it does work. I have been using them for last 3 years and have seen good growth of the plant without any clutter. I am going to have to show this to my mom. She has been having trouble with her tomato plants. This is so cool! My grandpa has this in his garden and the tomatoes are so great. This is pretty awesome. It’s good to have a little support for plants like tomatoes. I should totally do this as well. It’s so helpful. My kids would love this and I happen to have some PVC pipes laying around! What a great idea! I don’t know why I have never thought of using PVC before!! It really works well and so strong. Which was the most important thing for us. Thanks for stopping by. Thanks Ruth for stopping by. Good luck with your tomato plants! This is such a genius idea. We love tomatoes and like to grow them ourselves. But having something that will hold it up ix a challenge. Great idea! I’m going to try these this year. I noticed you have some type of tape around your raised beds. I have the same ones and they are falling apart also. What kind of tape did you use? I need to tape mine also. HI Lisa. Thats copper tape to keep snails from getting into my raised beds. I have to replace the tape every once in awhile because the sticky comes off of them. But it works. I was looking at the cage I will have same size garden. Can you tell me how may pieces per connectors did you get if I am to copy your cage? What do you have wrapped around the walls of your garden? I have the same ones and they are warping so bad. This is a fantastic idea! My Tomato plants get over 6′ tall here and the cages never hold up for long. I always end up creating a messy spider web of yellow twine that is tied, nailed, or screwed into anything close by and sturdy. My Husband is not thrilled with all the holes! I use to do the same thing Kimberlee. But this system works for sure. 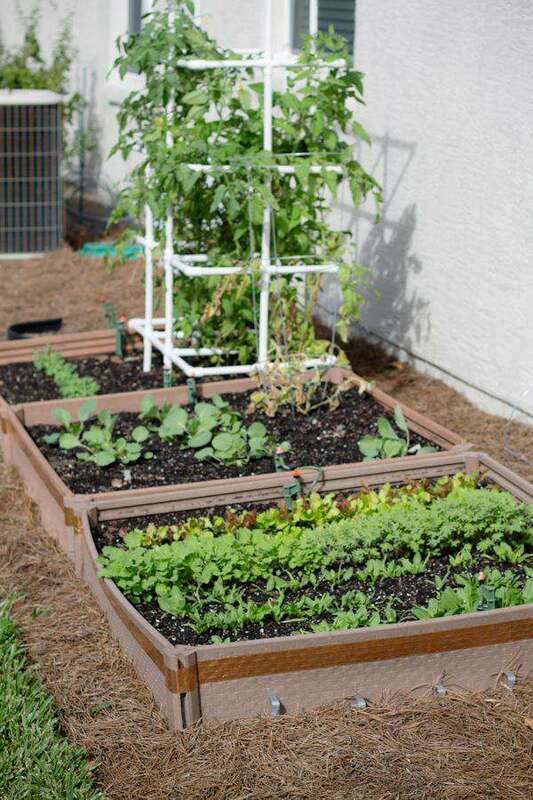 I love this and I am just looking at how to set up my garden. What are your boxes made from and where do you purchase the copper tape? Where did you find the 5 @way connectors? HI Debbie. We got them at our local hardware store. I’ve seen them online also.